We Didn’t Know We Could Make This Peachy Summer Dessert In The Slow Cooker, But We’re Sure Glad We Can! We’ve made other desserts in our slow cooker, but this one is definitely our favorite; it’s not fussy and the slowly cooked fresh peaches (doused in apple butter, brown sugar and bourbon, no less) taste like heaven on earth. 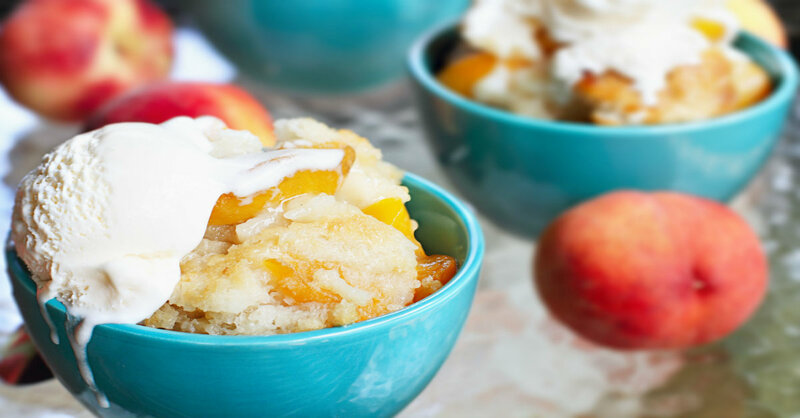 We didn’t think we could improve upon our long-time peach cobbler fave, but this slow cooker version topped it in just one bite. Don’t take our word for it; dust off your slow cookers and try it for yourself! Place peaches in slow cooker and add apple butter, brown sugar, bourbon (if using) and salt. Stir together until peaches are evenly coated and then spread out into an even layer. In a large bowl, combine baking mix, sugar and cinnamon, and stir together. Pour in milk and melted butter and mix until just incorporated. Drop large spoonfuls of batter onto peaches, making sure to cover the entire surface. Turn on HIGH and cook for about 5 hours (or on LOW for 8), or until crust is golden brown and toothpick inserted in center comes out clean. Uncover and serve hot with whipped cream or ice cream.